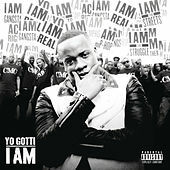 Yo Gotti's sixth album is buoyed by the hit "Act Right," where the Memphis rapper shouts out to the Bay Area and Mac Dre over a ratchet-style beat from HBK Gang's P-Lo. Listeners might expect him to focus on club rap, or use it to brighten his usual gutta homilies. But I Am is a mixed bag with a trap-rave number ("LeBron James"), a Future-like croon ("Die a Real N*gg*") and an urban radio lob in the Ne-Yo assisted "Respect That You Earn." A highlight is "Pride to the Side," where he tries to reach an understanding with his baby mama and a running partner "dipping in the pack."